Executives in Residence (left to right) Richard Evans, Paul Tellier and Raymond Royer share insights into global business trends with students at the Desautels Faculty of Management. Four of Quebec’s most accomplished and respected corporate leaders will be hanging their hats, at least occasionally, at the Desautels Faculty of Management this year. 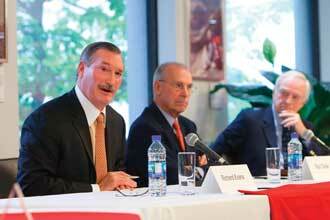 The Faculty launched its Executive-in-Residence program on Oct. 2 with a panel discussion featuring three of the new appointees: Richard Evans, Raymond Royer and Paul Tellier. Evans, a long-time aluminum industry executive, is the past President and Chief Executive Officer of global producer Alcan Inc. Royer is the former President and CEO of forest-products company Domtar Inc., which won plaudits from environmentalists as well as investors under his stewardship. Tellier served as CEO of Bombardier Inc., the big maker of planes and trains, after a highly successful stint as CEO of Canadian National Railway Co.
Also joining the group of Executives in Residence is Paul Desmarais Jr., Chairman and Co-CEO of Power Corp. of Canada . Under the new program, created through the Marcel Desautels Institute for Integrated Management, executives in residence will generally spend an average of one to two days a month in the Faculty during the academic year. The executives’ activities at Desautels will be tailored to their specific interests, and may include teaching classes in partnership with a professor; mentoring students; hosting roundtables on important current issues; and providing strategic advice to the Faculty and to the University. They may also help shape the management curriculum and share ideas with faculty members and researchers. At last week’s launch event, the three executives shared insights into the current state of the world economy and global business trends with students who packed the Faculty’s third-floor lounge. One result of the crisis, the executives agreed, will be an increased role for the G20 group of countries, and a diminished importance for the G8. That means more clout for China, India, Brazil and Saudi Arabia – and less for the U.S. and the U.K. It could also represent an opportunity for Canada. Evans, who had recently returned from global economic and metal-industry conferences in Europe, said the consensus that emerged from those meetings was that “we’ve clearly bottomed out of the crisis” and “we’re in the early stages of a recovery.” But the recovery is likely to be “uneven,” Evans cautioned, and “non-financial structural problems” will remain, including climate change, energy costs, trade imbalances, government deficits and demographic shifts. These challenges will re-emerge and could lead to crises of their own, he said.